As a die-hard Expendables fan, I'd normally be all about action figures of a certain age emptying machine guns and defying the laws of gravity and arthritis aches to save the world from eternal damnation using their fists and snide remarks. But, 2010's Red just didn't cut it for me. Perhaps it was for its lack of zest or slick plot, but it it just didn't gel well. In Red 2, the high-octane action-comedy sequel to the worldwide sleeper hit, retired black-ops CIA agent Frank Moses reunites his unlikely team of elite operatives for a global quest to track down a missing portable nuclear device. To succeed, they'll need to survive an army of relentless assassins, ruthless terrorists and power-crazed government officials, all eager to get their hands on the next-generation weapon. The mission takes Frank and his motley crew to Paris, London and Moscow. Outgunned and outmanned, they have only their cunning wits, their old-school skills, and each other to rely on as they try to save the world -- and stay alive in the process. What do you think? 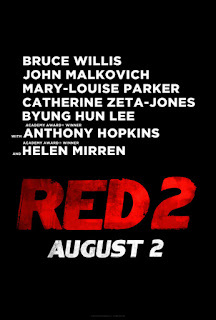 RED 2 hits theaters August 2nd. First one was far from perfect but I did have some good mind fun with it, hoping they fix some of the issues the first one had with the sequel.